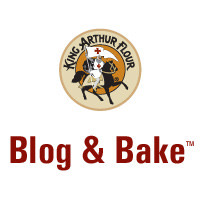 Excited to be selected as one of the bloggers at King Arthur Flour's Blog and Bake, April 21-23. Stay tuned for lots of blog posts and inspiration! Sometimes you have to bring spring to the table to fight off the when-will-winter-ever-end blues! For me tulips and asparagus seem to do the trick. With asparagus as the spring vegetable that symbolizes the start of the gardening season and tulips as the mid-spring season flower, you can't help but have hope!! And for me, I scored BIG at the Boston Design Center a couple of weeks ago and found a deeply discounted Victorian Majolica asparagus dish to finish off my happy table. I think in a prior life I made porcelain or pottery as I am drawn to dishes, pottery, plate ware, etc. any time I go into an antique shop. This plate is the icing on the cake as it shows off my asparagus polonaise while adding complimentary color and style. What inspires your spring tabletop design? A great thing happened this weekend. My stepdaughter, Caroline and her boyfriend, Adam plus two of his friends all surprised us for a visit. Caroline did call an hour before arriving to let me know and ask if it were OK. OK?? It's more than OK - they are 150% welcome - ANYTIME!! An unsolicited visit is like a gift!! What made me giggle and my heart sing was that Caroline and Adam both sold the idea of coming to Boulderwood by using my cooking as the hook. Who knew that 18 and 19 year olds would be interested in dining with adults, then playing some pool and ending the evening with a word association game of Apples to Apples. They were completely present. They relished their food, conversed with us and enjoyed sitting in front of the fire playing . Not once did any of them text, tweet, snap chat, instagram, FB etc.. 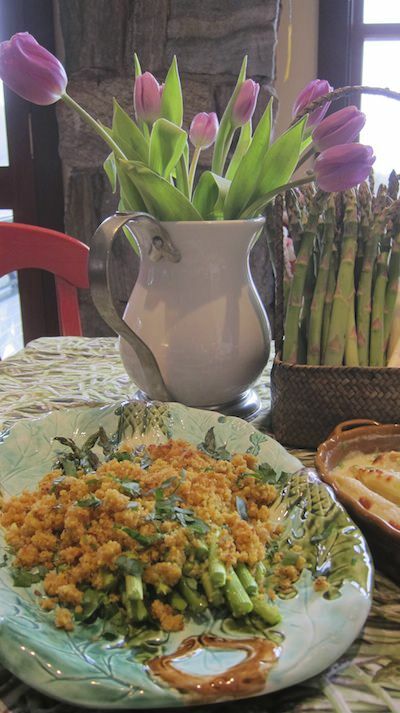 I have such gratitude that all the years of homemade meals that seemed to be taken for granted actually made an impact on Caroline and they are now offered as a selling point for a visit. This, to me, is the definition of success. And by the way, we loved playing the word association game and seeing the generational differences and similarities. It was the pop culture stuff where I saw the differences - like, one of them had no idea who Lucille Ball was. I guess I have some 'splanen to do! And, on the menu: Homemade Organic Buffalo Chicken WIngs, Gluten free liguini with tomatoe sauce (canned last fall), homemade garlic bread, salad with homemade dressing. Dessert: s'mores at the fireplace in the Living Room.